First produced by DuPont in 1959 in Canada, LLDPE has established itself as the third major member of the polyethylene business along with LDPE and HDPE. In 2016, LLDPE accounted for about 3% of the total polyethylene market. World consumption of LLDPE represents a global per-capita consumption of about 4–5 kilograms per person. 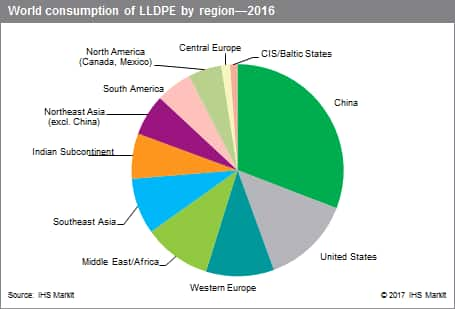 In 2016, the major LLDPE producing regions were China, the United States, Western Europe, and the Middle East and Africa. The Middle East, Canada, and Southeast Asia are the largest net exporters of LLDPE, while the major net importers are China, Africa, and the Indian Subcontinent. LLDPE consumption has increased at an average annual rate of about 5% since 2000. Over this time period, three regions contributed over two-thirds of the additional volume growth—China, the Middle East and Africa, and Southeast Asia. These three regions will continue to be major contributors to global LLDPE volume growth; however, the Indian Subcontinent is expected to have extremely high growth over the next five years. World consumption of packaging materials (mostly film and sheet) will continue to increase. Major drivers will be highclarity packaging, high-barrier thin films (replacing foil and metalized films) and “active” packaging (to increase shelf life, enhance flavors or destroy harmful bacteria). Growth will also occur as items now packaged in rigid containers transition to high-quality flexible packages. Film structures will increase in complexity, requiring consistent high-quality extrusion-grade resins that can also accommodate higher line speeds and thinner structures. Consolidation in the converting industry will accelerate, resulting in processors with global capabilities that will produce and ship materials from any location as economics dictate. Large purchasers of converted materials will use their purchasing power to actively bid one supplier against another, not only within a country or region but also between regions. Strong partnerships among resin producers, converters and end users will become more important. Global demand for LLDPE will strongly depend on economic growth, with world GDP growth expected to average about 3% per year between 2016 and 2021. The replacement of LDPE continues; however, each region is at a different stage of LLDPE penetration. LLDPE penetration in Canada is among the highest in the world, while in China, more LLDPE is still entering traditional applications of LDPE. LLDPE penetration in China is also being supported by a preferential import tariff, which is lower for LLDPE than for LDPE. One offset to volume growth is the continuing trend toward downgauging; this is expected to have a negative impact of 1–2% per year on consumption growth. In addition, Ziegler LLDPE demand is being eroded because of displacement by metallocene LLDPE (mLLDPE), which increases the overall use of LLDPE. Abundant low-cost feedstocks will continue to create opportunities for export-oriented plants and influence global LLDPE trade patterns. In the next five years, the Indian Subcontinent, China, and Southeast Asia will all significantly increase their LLDPE production. China will continue to be the world’s largest producer of LLDPE in 2021, but will still need to import well over one-third of its domestic demand. World consumption of LLDPE is projected to grow at an average annual rate of about 5% during 2016–21.